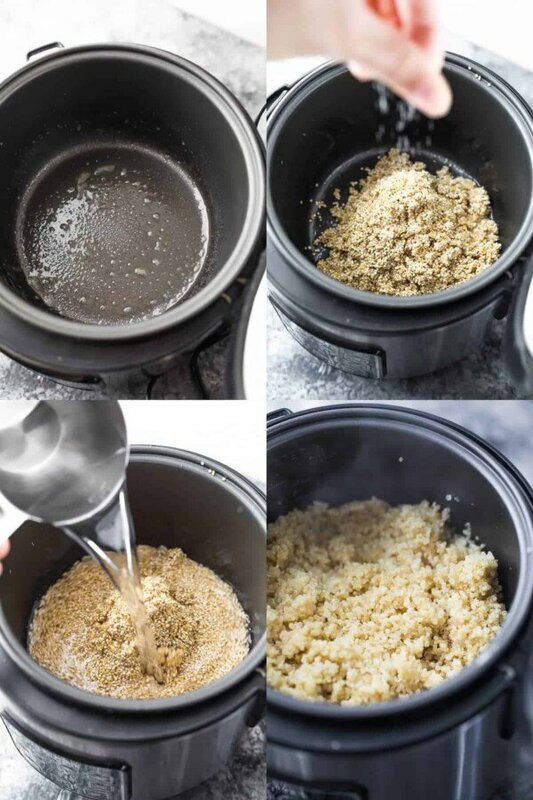 How to cook quinoa in a rice cooker- this hands off trick makes cooking quinoa even easier! 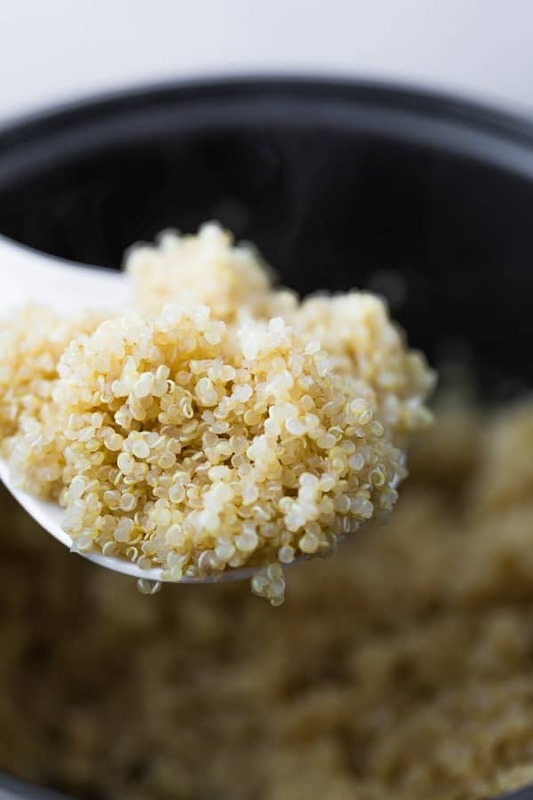 Cooking quinoa in rice cooker means no more worrying about your water boiling over, and perfect fluffy quinoa every time. But when it comes down to the appliance that we use on a daily basis, it’s the rice cooker. I first started using one when Ning, Ben’s Thai step mom, came to visit us. She insisted that we needed a rice cooker. I initially thought it was crazy…think how easy it is to cook rice on the stove top, why would we need a rice cooker? 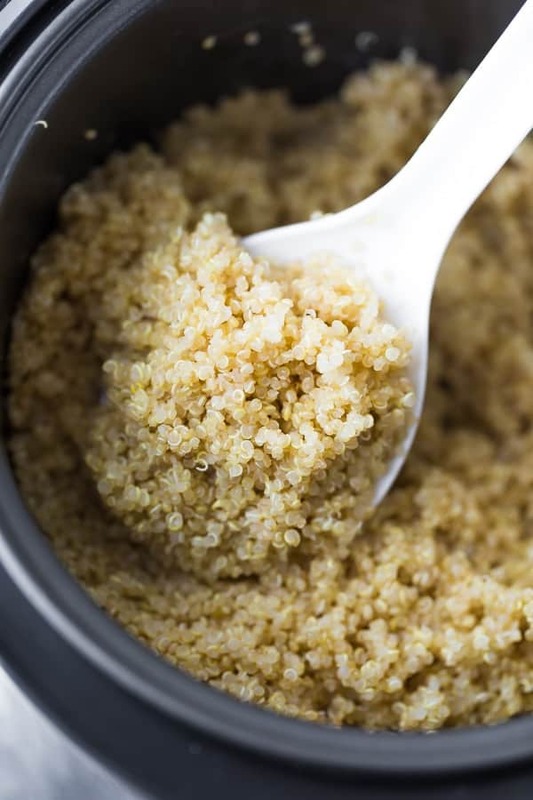 Yes, you read that right, the rice cooker also happens to make perfect, fluffy quinoa! 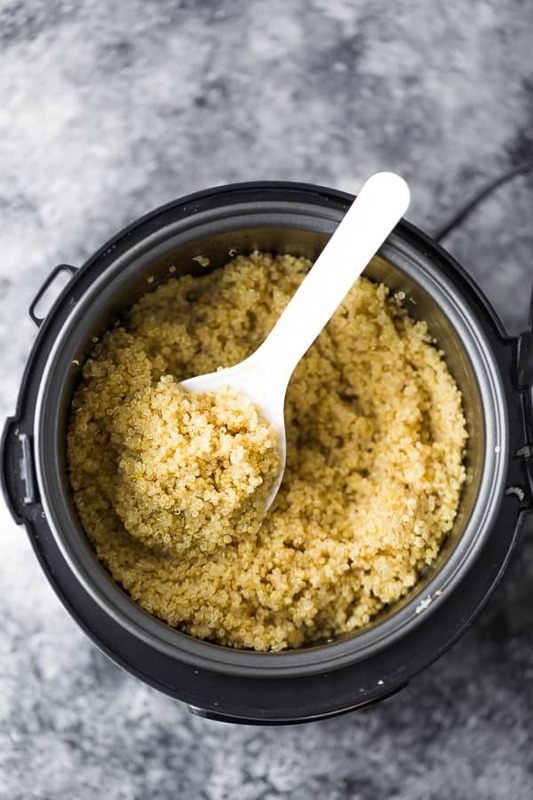 I’m sharing how to cook quinoa in a rice cooker with you here today. One of my favorite meal prep tips is to get your quinoa or rice cooking in the rice cooker while you prep your other ingredients. Spray the rice cooker base with oil- I find it really helps to keep the quinoa from sticking and drying. My faves are either coconut oil or avocado oil. Rinse the quinoa- supposedly you don’t need to do it, but I find my quinoa ends up even fluffier with a quick rinse. We use a colander and just rinse it under the tap for 20 or so seconds. Add the water. We are doing 2 parts water to 1 part quinoa. Cook! If you have a fancy rice cooker, select the option for white rice. If your rice cooker only has one button, push the button. That’s seriously how easy it is.
. When they say 8 cups, they are talking fully cooked rice. So that’s maybe 2 cups uncooked rice you can do. What else can I cook in my rice cooker? Apparently you can cook all sorts of things in the rice cooker including frittatas and mac and cheese (not really sure why you’d want to though?). I myself have cooked barely in the rice cooker (make sure you rinse it REALLY well, as it’s so starchy it can really clog up the steam valve). I will have to try farro next time. The Aroma rice cooker also comes with a steamer basket so you can steam veggies in there while the rice cooks. Looking to add more flavor to your quinoa? Spray the rice cooker insert lightly with coconut oil (optional but I find it helps keep the quinoa nice and fluffy all the way through). Rinse quinoa under the tap for 20 seconds in a fine mesh sieve. Shake off excess water and add to the pot. Add a pinch of salt, then 2 cups of water. Cook rice using the 'white rice' function (if your rice cooker has that option; otherwise just press cook). Thank you!!! I was gifted a one button rice cooker and I was finally able to make it! And it taste good! Lol first couple of times weren’t very successful on the stove top. First time visiting your site and first time cooking quinoa in a week old rice cooker. The results in a word: Fantastic! Used vegetable broth with organic quinoa and followed your instructions. I’m a believer. Thank you. Glad you enjoyed! It’s definitely the easiest way to cook quinoa 🙂 Thanks, Kevin! Love these easy recipes… specially the Qinoa cooked in a Rice cooker one! Thank you! So happy you’ve enjoyed them! This is my favorite way to cook quinoa these days! I’ve been cooking Quinoa for years. I’ve found, for my tastes that I like my Quinoa less cooked. When I make it in my Aroma pot I use 1/2 cup less liquid. The Quinoa comes out a little more firm. I make a large quantity so we can just take some when we want it. I tend to reheat it so having it cooked this way means it won’t get mushy. 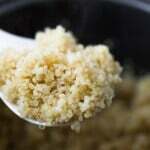 Quinoa can get mushy if over cooked. Thanks for the great recipe. I have seen your video & read the article. This is an informative article. Thanks for sharing such an article about uses of the rice cooker.